ON is a solo exhibition of new work and performance by Derrick Adams. 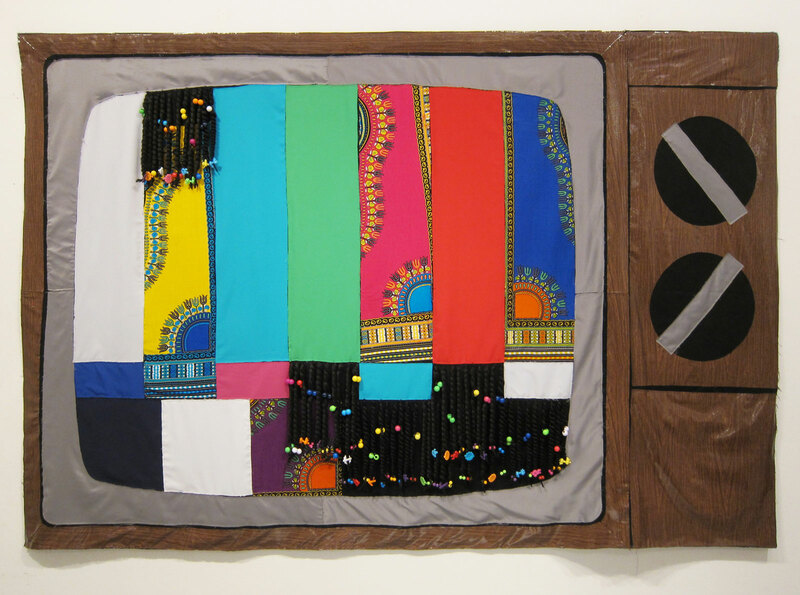 Through large-scale, boldly colored mixed media collages, performance, sound pieces, and illuminated sculptures, ON continues Adams’s investigation of consumerism and the dramatization of black figures in entertainment and popular culture. In the Pioneer Works main gallery space, Adams will present nine large-scale, mixed-media wall hangings (building upon his LIVE and IN COLOR series) that function as both sculptural objects and backdrops for live performance. On opening night, Adams will act as conductor, live mixing sound from mic’d performers within the nine settings into an orchestrated production that references television programs from the late 1980s and early 1990s as well as late-night infomercials. The performance will be recorded, then projected onto a gallery wall for the duration of the show. In the smaller gallery spaces, new static and sculptural works are presented within more meditative environments. In one space, nine lamp sculptures with braided wigs as shades will be surrounded by Adams’s new collage paintings: the Network Constellations. In another, night lights on a wooden frame will reveal a collage of video stills of 1990s television psychic Miss Cleo, with the monotonous sound of a broadcast signal. Each space will also incorporate a unique sound piece. Throughout the exhibition, the repeated use of the number nine alludes to the SMPTE color bar image—the most basic indication that the dated medium is switched “on.” For Adams, the concept of “on” functions as both a technical and performative motif, weaving together Adams’ sculptural, video, and performative practices.